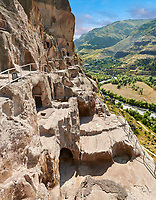 Picture & image of Vardzia medieval cave city and monastery, Erusheti Mountain, southern Georgia (country). Vardzia has become Georgia’s most famous cave city and monastery complex due largely to its connections with Georgia’s much beloved and iconic Queen Tamar. 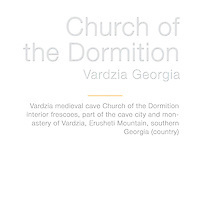 Legend says that Vardzia’s name id derived from “Ak var dzia” which translates as “here I am Uncle”, the phrase used by Tamar repeatedly when lost in and trying to find her way out of the caves of Vardzia. Although Vardzia was inhabited from the Bronze age with significant 5th century BC archaeological finds, the complex we see today was not started until the reign of Georgi III in 1156, who commissioned the development of a major town at Vardzia. His work was continued by the legendary Queen Tamar in 1186, whose reign was at the height of the so called “Georgian Golden Age” during which many of Georgia’s great ecclesiastic buildings were built. Vardzia is situated in a remote location in Southern Georgia, built into the cliffs of mount Erusheti on the left bank of the Kura River, thirty kilometres from Aspindza. The caves run for 500 meters in 19 levels high along the cliff face in a daunting defensive position. 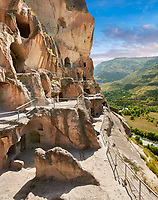 The eastern part of the Vardzia complex are 79 cave dwellings in 8 levels comprising of 242 rooms and 6 chapels. Today the cave dwellings are open to the elements having lost their stone frontages over the centuries during earthquakes. 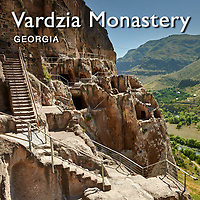 The western part of Vardzia comprises of the Church of the Dormition 40 dwellings across 13 levels and monastery rooms such as a refectory , chapels and bakeries. 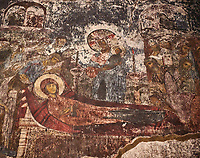 The Church of the Dormition, or Assumption, was cared out of the rock in the 1180,s under Queen Tamar’s patronage. Its interior is richly decorated with rock paintings using the secco style of painting common in Byzantine style artworks of the area. Although heavily influenced by the popular Byzantine ecclesiastic style of the era, the work still retains a Georgian look. Queen Tamar resided at Vardzia until her campaign against the Muslims, and her celebrated victory at Basian commemorated in the Hymns in Honour of the Virgin of Vardzia by Ioane Shavteli. Vardzia was fortunate to escape the Mongol invaders in the 1290s possibly due to its near impregnable defensive position described by Persian Safavid chronicler Hasan Bey Rumlu as a "wonder", "impregnable as the wall of Alexander the Great". Vardzia was not so fortunate when the Persians invaded Georgia under Shah Tahmasp I in 1551who sacked the city. the monastery was rebuilt but when the muslim Ottomans took Georgia in 1578, the monks of Vardzia departed and the site was abandoned.